The thing about computer technology – and consumer electronics in general – is that today’s silicon powered goodies tend to physically outlive their “soft shelf life.” In other words, even though you’re ready to upgrade a smartphone, laptop, or settop TV box, more often than not the device you’re itching to get rid of still works just fine. A newer version with better design and features may have come along, but the old version still functions as originally intended – problem is, that old version may not be fully upgradable to the latest software. Or the new version’s design might be too alluring to pass up. And so you upgrade and upgrade and eventually wind up with a drawer full of old phones, netbooks and mp3 players that aren’t exactly dead, but no longer serve you any purpose. Which is precisely why someone or other once said, “One man’s junk is another man’s treasure.” And, I think, why Craigslist was started. atv bootloader? XBMC? This guy was speaking my language! Turns out you can do a ton of hackery on an old Apple TV, including loading Xbox Media Center (XBMC) – and a handful of other media center apps – capable of handling more audio/video file types and codecs than Apple’s own software. The 1st Generation Apple TV hardware is powerful and flexible enough to deal with certain types of full 1080p video files, for instance, even though it’s officially limited to 720p at 24 fps. With HDMI and component video out, analog and digital (optical) audio out, integrated Ethernet and Wi-Fi networking, and that never-officially-used USB port, it’s actually a pretty capable and flexible little box. Hence the inordinate amount of time folks have spent getting everything from FTP servers to XBMC to, yes, OS X running on the thing. One email and a 20 minute car ride later, and boom! I had my $20 Mac. Well, almost … I still had to follow all of those crazy directions in Part Two and get the thing up and running. Cracking a first-gen ATV open is pretty easy, though it’s pretty hard to keep the bottom rubber pad intact while prying it loose – years old rubber plus adhesive equalled a torn up pad, at least in my case. Once the pad was torn away, however, the rest was smooth sailing – just a few torx screws to remove and, Voila!, Apple TV laid bare. From there I removed the 2.5-inch PATA hard drive and plugged it into an old USB enclosure so I could mount and access it via my laptop. Had I not screwed things up by attempting to repartition the drive manually, installing OS X would have been an easy task at this point. Instead I wasted several hours dealing with cryptic messages like “Partition failed with the error: POSIX reports: The operation couldn’t be completed. Cannot allocate memory,” because some glitch in my USB to PATA connection was preventing me from successfully partitioning the drive. 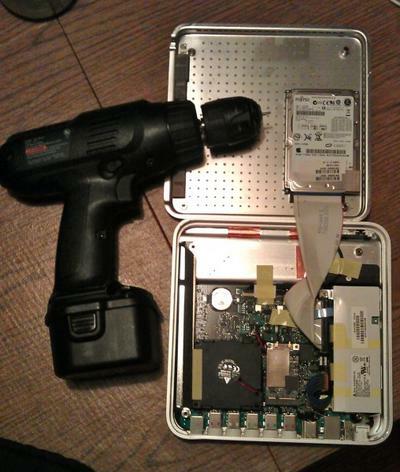 Unfortunately I didn’t have a second 2.5-inch enclosure lying around, but eventually I got the bright idea to put the drive back into the ATV unit, boot from the USB stick detailed in part two, and use OS X Disk Utilities to erase and repartition the drive. From there I used the OS X for ATV 10.5.8 disk image available via this hackint0sh.org thread and followed the directions also found there (as I mentioned in part two, I have a multi-user OS X 10.5 license that I purchased awhile back – in no way do I condone stealing OS X or any other software). And it worked – easy as that, I had a $20 Mac running OS X 10.5.8. As with the USB drive boot method, I was able to connect a USB mouse and keyboard to the Apple TV via a USB hub, and connect a monitor to the box via HDMI. And both Wi-Fi (Airport) and Ethernet networking work exactly as you’d expect from an OS X 10.5 machine. OSX on Apple TV is good enough for my media serving needs, but it’s not going to set any benchmark records. Running off the internal hard drive, 10.5.8 is responsive enough to set up iTunes, tweak system settings, and do a bit of text editing or even light Web surfing, but it’s not going to take the place of a Mac mini. I’m also not trying to use it to play any video – iTunes runs fine as an audio player, but video files sputter and stutter to the point of being unwatchable. As a low-cost, low-power server, however, Apple TV running Leopard is darn near perfect so long as you’re willing to tinker around a bit. My machine’s been up, running, and successfully serving audio and video to my other Apple TVs and iOS devices for over a week now without any crashes. A peek at the hackint0sh forums reveals a fair number of “Your Mileage May Vary” posts from others running similar setups. I’ve disconnected the monitor and USB hub/mouse/keyboard from my ATV box and am using Leopard’s Screen Sharing app to control the system from my MacBook Pro over Wi-Fi. The setup works fine, though it requires a little bit of patience. But it’s not like I’m doing it very often – I only need to get into the system when it’s time to add media files to iTunes. I did have to update iTunes to the latest version in order to support Home Sharing streaming to my Apple TV 2nd gen box, but the process worked just as it would on any other Mac, and Home Sharing is humming along. As for use as a Sonos server, so far I haven’t cracked that nut. For whatever reason, the Sonos Desktop Player fails to successfully share ATV’s iTunes library across my home network. Or at least that’s been the case thus far. It’s got something to do with how the ATV box shows up on my network as two separate devices, A Mac Server named “OSX Apple TV” and a PC Server named “mac0017f2fbxxxx.” There aren’t any support threads out there with tips on, “Troubleshooting your Apple TV as OS X box as Sonos server,” so I’m on my own here for the moment. But I’ll figure it out. Heck, if somebody figured out how to get OS X running on Apple TV and made the process easy enough for me to do it, the least I can do is solve this Sonos problem, right? Be sure to check out part 1 and part 2 of this series.